The largest part of our decision to move back home was the opportunity I had to be part of an amazing ministry. The company I work for is a full service design and imprint company dedicated to serving the youth ministry market. 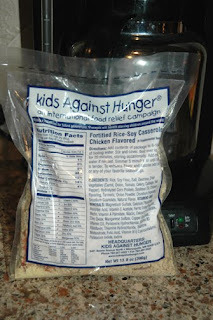 The difference between us and every other t-shirt company is the fact that every product we sell we devote a portion of the proceeds to purchasing the ingredients for, and packing meals for starving kids all over the world. 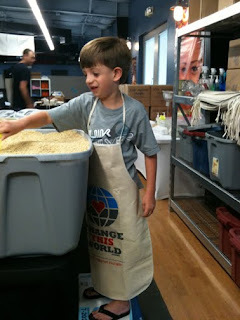 We are a satellite packaging facility for Kids Against Hunger. In addition we have also set up our own non profit called Change This World. Not only do we coordinate packaging events all over Florida but recently the Nation and soon the world (going to Africa in October). 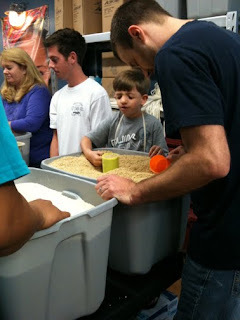 Each morning we also gather as a staff and package meals together. It is a reminder of why we do what we do and for who (the least of these!). I recently felt it was time to involve Andon in not only the packaging of meals but why it is important. The best way I could find to connect Andon to what is actually happening in the world was to share with him a video that completely impacted me SAM AND ESTER. After seeing the video it leaves you with a sense of despair and hopelessness. This has always motivated me to action but for some it paralyzes. I wanted to model for Andon that while their is a scary reality to life we CAN and SHOULD do something about it. Approximately 28,000 children die each day due to starvation and preventable diseases! This is not ok with our family. We always start out with prayer. After, we all find a station to serve. Andon and I decided to jump in at the Soy station. Their are four components to the meals. 1. 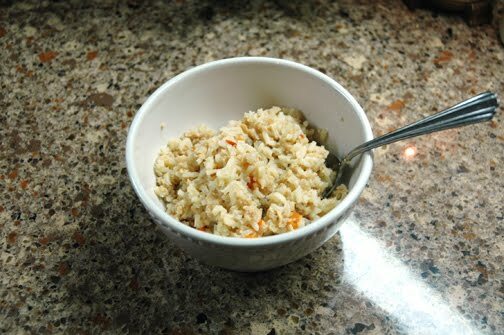 Rice, 2. Soy, 3. Dehydrated vegetables and 4. Vitamin and mineral powder. The food actually assists in reversing the effects of starvation. First goes the vitamins then the veggies, next the soy and last the rice. It only takes about twenty minutes and twelve people to package 864 meals! 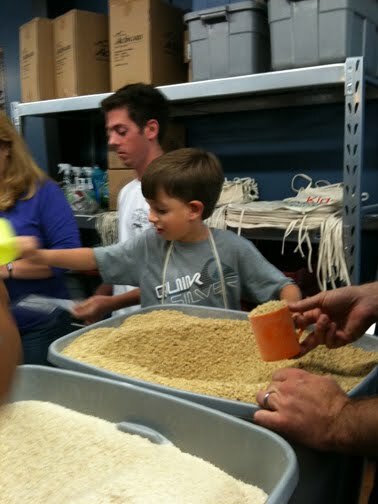 The company and non profit have packaged over 2 million meals in just six months. After packaging I decided to bring one of the meals home for all of us to experience what some eat every day (It's actually good). 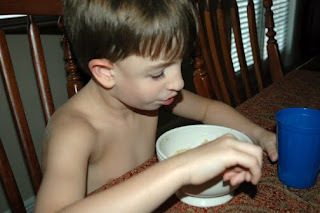 While we ate I explained to Andon that most children in the world do not have options like he does. No grocery store, no home with a pantry full of choices and in some cases no meals at all. I explained that the food we often throw away would be a blessing to them. My intention is to educate and involve him. My hope is that he not only understands what is going on in the world but realizes even one person getting involved can make a difference. On a side note, both Sam and Ester are doing well and Laurie regularly receives meals from our efforts! I love that you took Andon to experience that together... we totally want to do that with our kids, too.